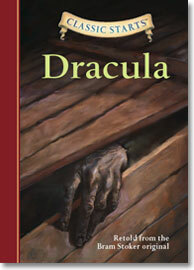 Retold from the Bram Stoker original. Dracula, that compelling creature of the night, continues his neck-biting ways in a version of the novel that children will devour. Moving from Transylvania to London, the timeless vampire serves up thrills and chills as he imprisons and terrorizes the innocent Jonathan Harker, and then goes after his fiancée, Mina, and her friend Lucy. From creepy, insect-eating Renfield to Dr. Van Helsing—who valiantly fights Dracula’s evil—the characters and drama are spellbinding.